Novoflex explains that its new PRO75 tripod is constructed with 8-layered carbon fiber legs alongside reinforced components. Buyers have a choice between three or four-section carbon fiber legs, as well as a pair of mini legs. The PRO75 model also supports existing TrioPod legs. The PRO base by itself will run you over $880 USD. The TrioPod PRO75 model can support a maximum load of 65kg / 143lbs and has a total of seven leg lock positions at 23-, 43-, 45-, 65-, 87-, 155-, and 180-degrees. 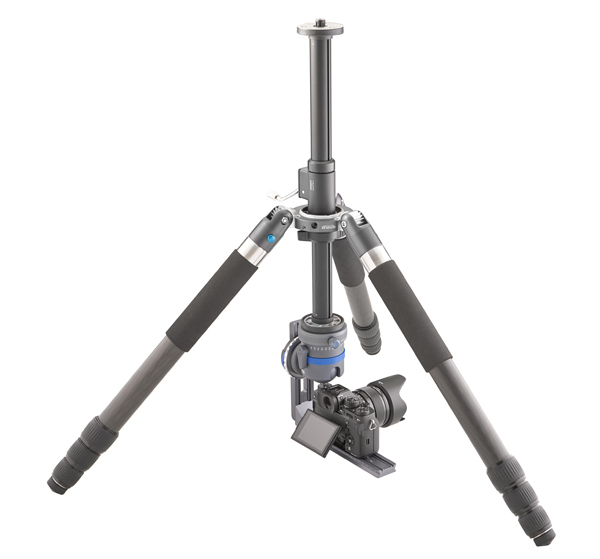 The tripod is made with a high level of versatility in mind, offering support for most 75mm accessories and both 1/4″ and 3/8″ connections, a removable base plate for using a leveling ball, and a self-locking geared center column. Of course, all of these capabilities are going to cost you a pretty penny. The TrioPod PRO75 base alone, without legs, costs a whopping $885.28. Add 3-section carbon fibre legs (plus 2 mini legs) to the kit and you’re looking at $1,476.64, while a set of 4-section legs by themselves will run you $663.52. To find out more about the TrioPod PRO75 lineup or order some bits and pieces for yourself, head over to the Novoflex website. The new Modular Tripod of choice for discerning professionals looking for the sturdiest, modular support solution. For almost four years, the NOVOFLEX TrioPod tripod collection has been lauded as the most innovative tripod system on the market. The Product Innovation Team at NOVOFLEX is proud to announce the expansion of this tripod series with a modular, high-capacity tripod system, the TrioPod PRO75. Exceptionally stable and modular with immense load capacity. The basis for the all-new TrioPod PRO75 is the advanced tripod spider, which offers exceptional stability and immense load capacity. Thanks to the reinforced design of the individual components and new 8-layered carbon fiber legs, this modular tripod can be used for even the heaviest photo and video equipment. The system can be purchased with 3 or 4 section carbon fiber legs plus two mini legs for maximum versatility. In addition to the recommended new tripod legs C3930 and C3940, existing TrioPod legs can also be used with the new TrioPod PRO75 as well. With the optionally available carbon leg extensions, a total height of 79 in./2.0 m is possible. Short 2-segment carbon fiber legs C2820 are also available allowing you to achieve completely new perspectives and are even compatible with the existing TrioPod and QuadroPod Systems. Maximum Load Capacity – 143 lbs/65 kg – Maximum holding capacity for maximum protection. Removable Base Plate – A new feature of the tripod spider is the removable base plate that easily be detached and replaced with the optional leveling ball (MBAL-PRO75) or a geared center column (TRIO-CC-PRO75). Unmatched Versatility – To build your tripod to meet the needs of any job the PRO75 can fit most 75mm accessories, even from other manufacturers. The optional leveling ball (MBAL-PRO75) can also be used with any other tripod you may have with a ¼” & 3/8” connection. Self-Locking Geared Center Column – The innovative 3/8” studs on both ends of the geared center column provide an extra measure of security and compatibility by taking the load off the ¼” threads. The column itself can be adjusted by 19 in./48 cm. 7 Leg Lock Positions for Any Situation – For shoots on level surfaces, the TrioPod PRO75 spider allows the legs to be set at 23°, 45°, 65°, and 87°. Should you find yourself in a more confined space, a further locking position of 155° enables you to support the tripod against vertical surfaces. Particularly innovative is a new 43° angle that allows the tripod to flip upside down quickly for ground-level work, eliminating the need to reverse the center column and/or tripod head. For easy packaging, the legs can also be folded up at 180°. TRIOPROC3930 – consisting of TrioPod PRO75 tripod spider, (3x) C3930 3-segment carbon fiber legs, (2x) A1010 mini-legs, a tripod bag and multi-tool. TRIOPROC3940 – consisting of TrioPod PRO75 tripod spider, (3x) C3940 4-segment carbon fiber legs, (2x) A1010 mini-legs, a tripod bag and multi-tool. The two QLEG-A1010 mini-legs that are part of the kits can be screwed into the accessory thread creating limitless possibilities: Add one leg to smooth your workflow by attaching your camera bag, keeping your tripod weighted and giving you quick access to your equipment. Alternatively, replace two legs to create a “leaning pod” and achieve a new variety of creative perspectives for your boundless imagination.